A voyage of visual epistemology begins with an urge for the dynamics arising an inquiry into the visible and the absolute void. 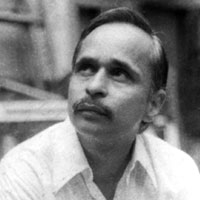 Prabhakar Barwe, with a patrilineal inheritance of visual art, was born in Nagoan, Maharashtra in 1936. Receiving encouragement from his sculptor father and support from his grand-uncle Vinayak Pandurang Karmarkar, young Prabhakar went through schooling at Sir J.J. School of Art, Mumbai between the years 1954 to 1959. Besides his primary education, Barwe’s life has been ingrained into the city of Mumbai. An interesting transition in Indian art can be noticed between the generations; Karmarkar, a sculptor, bred under the Edwardian academic tradition expresses his apathy and objection against the newly borrowed modern art movement, suggesting young, curious Barwe to focus on the study of realism. However, with an urge to explore multitudes of the aesthetics of image making under the influence of contemporary artists like Gaitonde, Mohan Samant and Ambadas, Barwe furthered his study to the crux of visual language, disregarding the clerical act of imitative imagery. His inquiry was coupled with exposure to the theories of Paul Klee and Ben Nicholson, which are evident in his own writings. Occupation and mode of sustenance became a distinct feature of his life and art practice. By joining the Weavers Design Service Centre in early 60s, the artist maintained a particular schedule of working. He was involved with leading artists such as Gautam Vaghela, K.G. Subramanyan and Ambadas at the Centre. Throughout his service he constantly created new designs for the weavers, which enhanced his understanding of forms. The daily practice of diary writing occupied him as his concluding task before leaving the office for his cozy studio space at Gamdevi. From1962 till 1965, Barwe was posted at Varanasi, where an encounter with the Tantric forms captured his interest - leading into a Tantricist phase in his works. This concludes with a realization of being an artist and not a Tantric to endeavour it further. Writing became his second nature; he practiced it meticulously and lovingly, which is explained by the prevalence of numerous letters, written to his daughter, Sonali, and to others in the arts community. Full of circumlocutions, his verbal analysis of visual intricacies formed a basis for critical thinking in aesthetic decisions. This phenomenon is evidently influential in the works of many young artists who conversed with him and his book Kora Canvas in Marathi. Rather than his personal life, Barwe notes an expression of curiosity and discussion as he theorizes a his thoughts on art. Thus, occupation for him was either his art practice or writing. Barwe’s familial life depicts his inhibitions for machines and mechanisation, yet he appreciated the possibilities of image approximations through technological advancements via computers. A computer art show, curated in 1991, invited several leading artists to produce their creations through a digital medium. With a mixed view of the experience collectively, Barwe in particular was curious about this innovation and the modern mode of image manifestations. Although he designed a safety-pin on a machine, Barwe eventually chose to manually transfer the form, which was then titled 'Eighty-five safety pins'. With an affinity for contemporary practice, as opposed to academic realism in his formative years, the artist worked with the zeal of a scientist. His inquiry for an apt medium for image making was coupled with constant and pertinent interrogation linked to his derivative thought process. Enamel paints were used during his stay in Varanasi to overcome the obligation and non availability of oil colours - despite knowing the shortcomings of the medium. With a gradual progression in the technique, the artist explains his need for a certain sheen - where he successfully blends commercial paint to achieve a result beyond oils, through a layered method. Numerous accolades signify his distinct position in the field of visual arts. These include awards from the Academy of Fine Arts in Kolkata in 1963, the Bombay Art Society in 1964 and 1968, the Maharashtra State Award in 1971 and the prestigious Lalit Kala Akademi award in 1976. To summarize the participation of his works in various exhibitions: his international participations include IX Biennale, Valpariso in Chile in 1989; II, III, IV and V Triennale at New Delhi in 1971, 1975, 1978 and 1982 and the Fifth International Young Artists at Tokyo in1969. Around 12 solo shows are attributed to his career from 1961. During the years 1961 to 1965 and in 1969 he was conferred upon with the Yomiuri Shimbun Award in Tokyo, Japan at the Fifth International Young Artists' exhibition. In 1983 the Modern Indian painting exhibition at Hirshhorn Museum, Washington, D.C. and the IX Biennale International, Chile in 1989, signify his contribution to Art. In late 1988, he was selected under the International Visitor's program Grant, sponsored by the USIA. This was followed by a residency programme at Yaddo, the artists' village established in America. The artists’ visit to America brings with him several curiosities and evolutions in his works. His creation ‘Blue Cloud’ brought him the National prize at an exhibition of Lalit Kala Academy in Delhi. Barwe loved solitary existence, engaged with painting on a single canvas for hours, days or even months. He enthusiastically engaged in long discussions with artist friends. Here also, he spoke only of art. Being witness to the illness of his parents, Barwe developed a severe inhibition to medications and hospitalisation, which cost him prolonged sufferings, pushing him towards the inevitable. With a frail physique, he continued to make few drawings and with feeble voice, muttering ideas on art to his friends visiting him at the hospital. December 6, 1995 marked his demise pronouncing a vacuum in the art-world and imposed a conclusion to his visual epistemology.